Parfleche (black), 2018, earthenware and glaze, 16" x 12" x 2"
A trip to the Cappadocia region of Turkey in 2013 had a significant impact on my work in ceramics. For many years I have pored over images of the caves that, for millennia, have been carved into the soft volcanic formations of the Cappadocian landscape. These caves have organic, white, honeycomb-like interiors punctuated by archways, columns, and windows. Light from openings in the walls filters in and shifts around the softened shapes of the interiors, creating changing envelopes of space. The Parfleche wall reliefs are influenced by my experience of the caves and also by Native American bison-hide carrying cases called parfleches. These are envelopes, too, in a literal sense: rectangles made of folded hide, painted with abstract designs, and used to store and transport provisions. I have never had the chance to untie and open a parfleche, I only know them from their exteriors, yet the slim, creased interior space implied by these wrapped cases captivate me in much the same way as do the Cappadocian caves. My Parfleches depart from my usual passion for highly glazed surfaces. They are solid-cast with slip (liquid clay) in flexible molds that are configured to encourage what might be considered technical flaws. 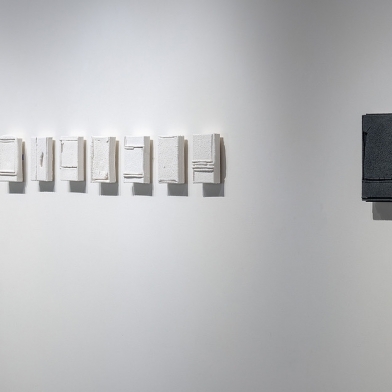 In these pieces, the markings and fissures left by their forming process contrast with grid lines that recede into the mass of the objects, aiming for a tension between order and entropy. They provoke me to consider the mysterious interior of a form. Architecture usually begins with a building up from the earth. My interest now is equally in the end or memory of architecture, its inevitable succumbing to gravity and decomposition, and its return to the earth. Check out this great interview with Cary in 2016 in Flatland KC magazine. Zanesville Prize, Seilers’ Studio and Gallery, Zanesville, Ohio, 2017. Casting Shadows: 2017 KCAI Biennial, H & R Block Artspace, Kansas City Art Institute, Kansas City, MO, 2017. The Once and Future: New Now, Sherry Leedy Contemporary Art, Kansas City, MO, 2016. Chromaphilia, KCAI Crossroads Gallery: Center For Contemporary Practice, Kansas City Art Institute, Kansas City, MO, 2016. 50 Women, American Jazz Museum, Kansas City, MO, 2016. Archie Bray Foundation Resident and Visiting Artists, Belger Crane Yard Gallery, Kansas City, MO, 2016. Every Semester: Collecting KCAI Ceramics 1995 – 2015, Belger Arts Center, Kansas City, MO, 2016. Recent American Ceramics from the Dr. Harold F. Daum Collection, Daum Museum of Contemporary Art, Sedalia, MO, 2016. Summer Invitational, Sherry Leedy Contemporary Art, Kansas City, MO, 2016. Dimension and the Space In Between, Belger Arts Center, Kansas City, MO, 2016. In Pursuit, H&R Block Artspace, Kansas City, MO, 2015. Summer Workshop Artists Exhibition, Belger Crane Yard, Kansas City, MO, 2015. The Center is a Moving Target, Kemper at the Crossroads, Kansas City, MO, 2014. Analagons, Daum Museum of Contemporary Art, Sedalia, MO, 2014. 20th Anniversary Clay on the Wall Invitational Exhibition, curated by Glen Brown, Landmark Arts, Texas Tech University School of Art, Lubbock, TX, 2013. Narrow Margins, H&R Block Artspace, Kansas City, MO, 2011. Bray Collaboration, Holter Museum of Art, Helena, MT, 2011. Kansas City Clay, Red Star Studios, NCECA Expo Gallery, Tampa, FL, 2011. Sherry Leedy Contemporary Art, (SOLO), Kansas City, MO, 2010. Creating and Collecting: Kansas City and Contemporary Sculpture, Nelson Atkins Museum of Art, Kansas City, MO, 2010. (Re)Form, H&R Block Artspace, Kansas City Art Institute, Kansas City, MO, 2010. Six McKnight Artists, Northern Clay Center, Minneapolis, MN (catalog), 2010. 25th Anniversary Summer Exhibition, Sherry Leedy Contemporary Art, Kansas City, MO, 2010. Connecting with Contemporary Sculpture, Museum of Art and Archaeology, University of Missouri, Columbia, MO, 2010. Evermore: Pattern & Process, Epsten Gallery, Overland Park, KS (catalog), 2009. KCAI: Then and Now, Red Star Studios, Kansas City, MO, 2009. Craft in America Exhibition and Catalog, venues: Arkansas Arts Center, Little Rock, AK; Museum of Contemporary Craft, Portland, OR; Mingei International Museum, San Diego, CA; Houston Center for Contemporary Craft, Houston, TX; Cranbrook Art Museum, Bloomfield Hills, MI; National Cowboy & Western Heritage Museum, Oklahoma City, OK; Palm Springs Art Museum, Palm Springs, CA, 2007-2009. Kansas City Flat Files, KCAI H&R Block Artspace, Kansas City, MO, 2008. It’s Only Natural, KCAI H&R Block Artspace, Kansas City, MO, 2007. Northern Clay Center, McKnight Residency, Minneapolis, MN, 2010.
International Ceramics Studio, Kecskemet, Hungary, 2003. Watershed Center for the Ceramic Arts, Newcastle, ME, 1999. Visiting Artist, Archie Bray Foundation, Helena, MT, 2015. Distinguished Achievement Award, Kansas City Art Institute, Kansas City, MO, 2013. Faculty Development Grants, 13 grants awarded between 1996 and 2015, Kansas City Art Institute, Kansas City, MO, 1996-2015. McKnight Foundation Ceramic Artist Residency, 2009. Lighton International Artists Exchange Program, Kansas City, MO, 2003. In March 2019, the annual NCECA (National Council on Education for the Ceramic Arts) will be held in Minneapolis, MN. 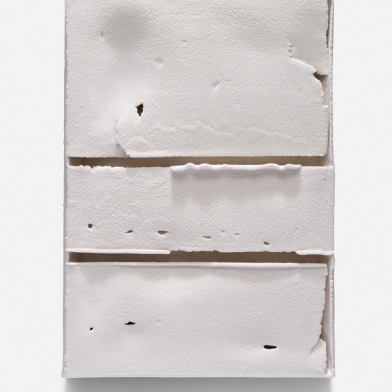 Cary Esser has been selected by curator Elizabeth Carpenter to particpate in THE FORM WILL FIND ITS WAY: CONTEMPORARY CERAMIC SCULPTURAL ABSTRACTION from January 22 to March 30, 2019.